Our layflat tubing is a versatile and economical packaging material as you can use it to pack together objects with the same width but with different lengths, and also make your own plastic bags. 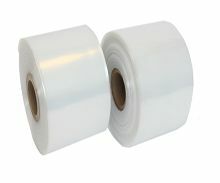 The polythene tubing is ideal for packing items with odd shapes. Simply insert the product into the plastic sleeve, cut the polythene according to its required length, heat seal or staple at both ends, and you’re done! If you use our heat sealer with cutter you can do this or make plastic bags in one go. Our poly tubing comes in medium or heavy-duty strength and in 15 widths. Polythene tubing is often used to pack or wrap items which are difficult to bag, such as posters, light tubes and plants. The cost-efficient clear poly-tubing roll is easy to use and available in medium and heavy gauges, with a choice of 15 widths from 2 to 36 inches (5-91.5cm). Please note, these measurements are taken across the layflat tubing when lying flat, not the diameter after it has been filled. Poly tubing is also a simple way to produce packing bags of different sizes. Choose the continuous roll of polythene tubing to your required width, and cut and seal to the desired length. It’s that simple, you don’t have to be an expert! Perfect to use with our heat sealers, our layflat tubing provides protection against dust and water during transit or in storage. The plastic sleeve is made from polymers of high quality, giving clarity and high strength. The medium duty layflat tubing is 250 gauge, ideal for general packing applications, while the 500 gauge heavy duty polythene tubing is perfect for fragile or heavier items.